The strawberry is the most popular type of berry in the world. There are hundreds of varieties of strawberry that vary in size, color, taste and texture. But they all share the same characteristic heart-shaped structure with red juicy flesh and seeds on the surface. But The Strawberry Is NOT A fruit! Although usually referred to as a fruit, the strawberry is actually an accessory fruit or “false fruit”, since the red fleshy part doesn’t develop from the flower’s ovary, but is derived from the non-reproductive parts of the flower. The real strawberry fruits are achenes: the minute hard seeds of varying colors (yellow, green or red), embedded in the strawberry surface. The seeds are actually inside of the achenes. Ripe, fresh strawberries are sweet and juicy. They can be eaten as they are, used to garnish a variety of sweets and desserts, or enjoyed as delicious refreshing juice and smoothies. Strawberries are packed with a variety of antioxidants, including the flavonoid anthocyanidins (which gives the fruit its characteristic red color), vitamins C, E and beta-carotene. They are also rich in dietary fiber, flavonoids, potassium, folate, vitamins of the B complex (B2, B5, B6), biotin, manganese, iodine and zinc. Strawberries are very low in protein, sugar and calories, and virtually devoid of fat and cholesterol. The strawberry is a nutrient-dense food, with such a huge amount of healthy goodness that they are often included in lists of “superfoods”. Strawberries help fight anemia: Strawberries can help prevent and fight certain types of anemia, due to their high content in folate, which is essential for the synthesis of hemoglobin, the protein in red cells responsible for carrying oxygen throughout the body. Strawberries help prevent cancer: Strawberries are included in the list of top “superfoods” that help lower cancer death rate. This is because of the very high content of various anti-oxidants with flavonoids that work in synergy to produce a powerful protection against oxidation, preventing the damage caused by free radicals in our body. Strawberries act as an anti-coagulant in the blood: Strawberries contain moderate amount of acetylsalicylic acid, the same active ingredient found in aspirin. Although the amount of acetylsalicylic acid found in strawberries is not enough to relieve influenza symptoms, it can help to thin the blood, prevent the formation of blood clots and so reduce the work of the heart and improve its function. Strawberries act as an anti-inflammatory: Anthocyanidin is a flavonoid found in strawberries that acts against inflammatory conditions such as asthma, gout, artherosclerosis, arthritis and rheumatoid arthritis. At the same time it protects against intestinal bleeding. Strawberries can improve memory and concentration: It has been shown that, besides having an anti-anemic effect, the folate found in strawberries can help improve memory, concentration and the brain’s ability to process information. They can also help prevent brain defects in babies during pregnancy. Strawberries aid digestion and detoxify the colon: Due to their high content in vitamin C, strawberries stimulate the secretion of salivary and gastric juices, thereby improving the digestion of starchy and protein foods. In addition, the fiber contained in strawberries effectively reduces constipation and cleans the colon, providing a beneficial detox effect for the body. Strawberries are a diuretic: The high content in potassium found in strawberries enhances diuresis, which contributes to detoxifying the body, as well as regulating blood pressure. Strawberries promote healthier blood vessels: The anti-oxidants found in strawberries, and especially vitamin C and anthocyanidins, may help protect arteries from damage, as well as preventing the formation of blood clots within blood vessels. Strawberries help fight off cold: Strawberries are very rich in vitamin C, which plays a key role in enhancing immune system function, as well as in preventing and fighting infectious diseases such as flu and cold. 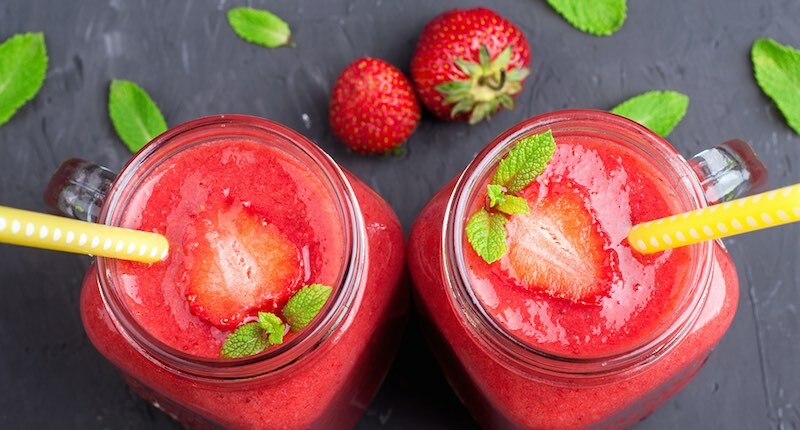 Strawberries can even put us in a better mood: Eating strawberries and drinking strawberry juice stimulate the release of serotonin, which improves mood and is responsible for a feeling of relaxation and a general sense of well-being. In temperate climate zones strawberries are in season from late Spring to early Summer. However, they can be found year-round in fresh fruit markets or commercially packed as frozen, juiced or dried. Strawberries are very delicate and prone to attack by insects. Consequently they are often sprayed with pesticides to prevent them being destroyed by pests. Choose organic if possible. 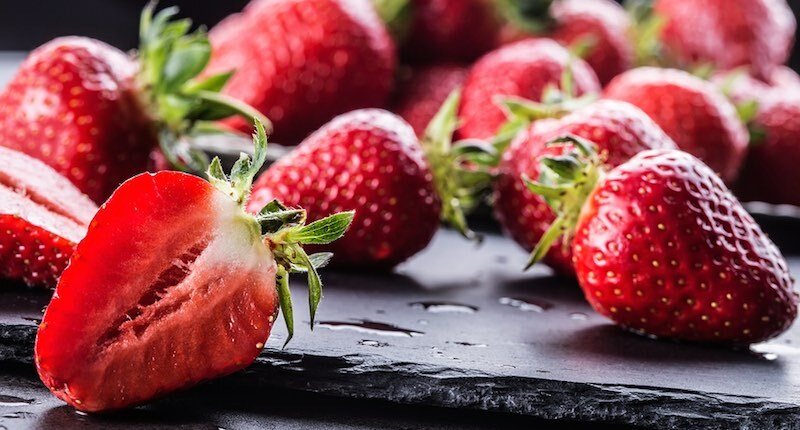 If non-organic, soak your strawberries in clean water and a cupful of apple cider vinegar and a pinch of sea salt for 10 minutes; then rinse to remove the pesticide residues where possible. Add sliced strawberries in fruit or green salads, or in plain yogurt. Strawberries would mix well with banana for a nice delicious and nutritious smoothie. In temperate climates, strawberry season runs from late Spring to early summer. Like most fruit and vegetables provided by mother nature, the best time to consume is when they come in to season in your area. This is when your body is likely to crave and benefit the most from their nutrients and healing properties. Smaller and far tastier than their cultivated cousin, wild strawberries can be found in woodland and meadows throughout early summer (though you must be 100% sure of what you have found before eating). What are the side effects of eating Strawberries? Strawberries are one of the foods most commonly associated with allergic reactions, but this is only because of its very potent and powerful antioxidant agents that react with a toxic body, triggering bodily reaction with symptoms like hives and itchiness. Strawberries contain moderate levels of oxalates. Thus, individuals with a history of calcium oxalate should limit their consumption of them. All berries are great source of vitamins, phytonutrients, minerals and trace elements. Compared with other berries, strawberries are particularly rich in vitamin k.